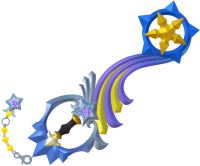 The Shooting Star is a keyblade introduced in Kingdom Hearts III, obtained after the first visit to Twilight Town. It is mostly blue, yellow and purple, though part of its handle is silver. Its keychain is shaped like a star. Its transformation is twin arrowguns.